Sometimes, when you are displaying your adverts to people, the same ones over and over will simply not do. Usually, your adverts in Google AdWords will introduce your products and services to potential customers, for the first time. This is effective, but what about the people who have already visited your site once already? It is beneficial to make your adverts as effective as possible, while catering to the right group of people, including those that have already seen what you can offer. Building a Remarketing List in Google AdWords, can provide you with an alternative way of keeping your adverts targeted properly. What is a Remarketing List? Remarketing Lists are lists of visitors who have visited your website, that meet certain criteria that you can dictate to whatever standard you require. The purpose of these lists is to provide a selected group of people to target with specific adverts, that your default ads may be unsuitable for. For example, you may want to design an advert that is aimed at people who visited your site and looked at least 3 different pages, which would indicate that they were interested, and target them directly. Or as another example, create a list of people who have purchased a product from your website, to notify them of other or similar deals that they might like to see. It is possible to make a collection of lists with various criteria, so that all your needs are met for whoever you decide to target. 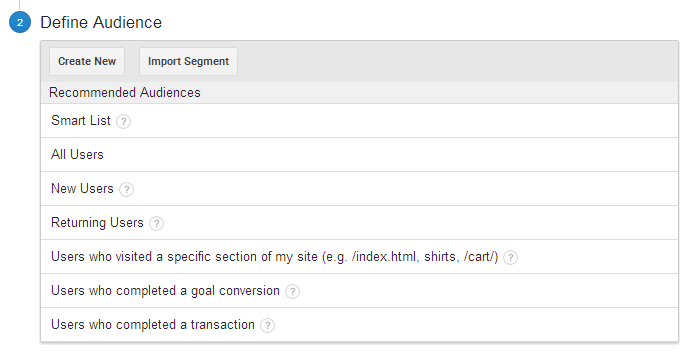 Building a Remarketing List is surprisingly easy within Google Analytics. To begin, head to the navigation panel at the top, select Admin, and from the Property Settings, choose Remarketing, and then Audience, as shown. From here, you will be able to see all of your current remarketing lists that you have available for use. It is perfectly fine to have many lists, all of them can be used to target specific sub-sections of your audience. Create a new list here. On a side note, be aware that you can, like segments and custom reports, import an existing remarketing list template from the Google Analytics Solutions Gallery, if you happen to find one that suits your needs. For now though, go ahead and create your new list manually, to see what options you can set for yourself! First of all, select your view (Analytics) and destination account (Analytics & AdWords) for the Link Configuration. This is just so that the Remarketing lList can be linked in properly for use within Google AdWords. Proceed to hit Next Step to begin the construction of your criteria with ‘Define Audience’. You will be presented with a selection of pre-defined lists, some of which may have a customisable option that you can set, but they are all fairly simple in comparison to a fully custom list. You are offered some lists already built, though making a custom one gives you more control. Choose Create New to start building your bespoke list. This will open up a new window, with a lot of available settings. It is here that you can set all of your targeting options to select the right visitors that you want to aim your adverts at. This section allows you to select age ranges, gender information, and directly or broadly target the locations that your visitors have visited from. Options here include targeting specific devices, such as desktop or mobile, or visitors with certain screen resolutions (if you have a large, complex advert to deliver). You can even select visitors using a particular operating system, or browser version, if you require to. This tab lets you pick and choose actions that visitors have taken on your website, such as how many times they have visited or how long it has been since they last did so. If a potential customer hasn’t visited in over 30 days, why not have an advert tailored to them to remind them of what you can offer? Quite a niche option, but can be useful if you were perhaps running a sale and obtained a lot of new visitors during that time. Remarketing a new sale to these customers may have them participate once again, or even become a regular customer. The final basic settings allow you to select visitors based on how they arrived at your website. You may want different adverts for people visiting directly, or those who have arrived via a mailshot that you have sent out. More options are available, for advanced users. It’s quite a lot to go into in today’s post, but feel free to peruse the options and see if they can be of use. Most of them are a building a set of conditions that either include a visitor, or not. How effective will your list be? Once your Remarketing List has been built, you can see how well it can perform, as Google Analytics will apply the filters you have created to existing data (default is the past 7 days) and see how many visitors it would apply to. You can also set the membership duration, which in short, is how long to keep a member in the list. 30 days is the default, and it’s handy to have as it clears out inactive visitors from your list. Be careful though, as you will want to make sure you get sufficient visitors over 30 days. A Remarketing List must have 100 visitors within in it at any one time to be used, otherwise it will become inactive until it reaches 100 again. Finally, give your Remarketing List a name, and you are done! The list can be applied to your Google AdWords using the Shared Library, to a remarketing campaign, which will only target the visitors from the list. Let us know how you find using Remarketing Lists in the comments below, and good luck. Google support documents have a lot of useful information on remarketing, as you can create lists in Google AdWords as well as Analytics.